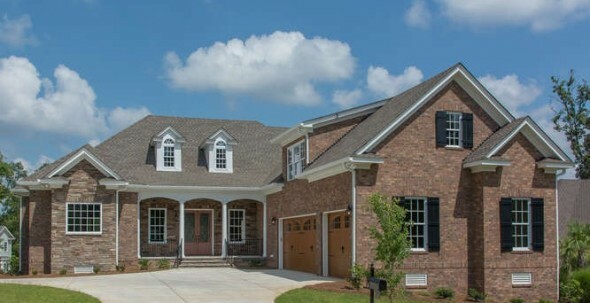 Dunbar Builders, the luxury residential home building company in Columbia that is celebrating its 20th anniversary this year, has just completed another stunning new luxury home in Saluda River Club. Located on a desirable corner lot in the back section of the award-winning community’s River District, on 417 River Club Road, the 4,150 sq. ft. home features 4 bedrooms and 3.5 baths, as well as a three-car garage. Lots of natural light floods the elegant and spacious open floor plan, which is great for entertaining year-round. Whether preparing holiday parties or everyday family meals, the kitchen’s high-end appliances, luxury finishes and custom cabinetry make it a joy to linger here. In addition, the home is built according to stringent energy saving guidelines, including 5.5” open cell foam insulation in the roof deck. Notes Dunbar: “Insulation, roof products, windows, doors and skylights all can affect the performance of your home with regard to energy efficiency. At Dunbar Builders, we look for building products that meet ENERGY STAR requirements. To earn the ENERGY STAR rating, a home must meet strict guidelines for energy efficiency set by the U.S. Environmental Protection Agency. “We estimate that the new owners of this home will save up to 50% on their annual utility bills – without sacrificing features, style or comfort. This can be translated into up to $50,000 off their mortgage,” according to Dunbar. Well-appointed outdoor living spaces are also important to today’s buyers, and this lovely River District home has a large screened-in porch on the back of the home including an exterior fireplace, letting homeowners take advantage of the mild spring and fall seasons in South Carolina. Originally from Indiana, Dunbar moved to South Carolina in 1969. After a career in banking, he started his custom home building company in 1994, and his son Patrick Dunbar Jr. joined him fifteen years ago. To learn more about this home in the River District and other homes at Saluda River Club, please schedule a visit soon. For more information or directions, please call 803-358-3969 or visit www.saludariverclub.com.